Each year, hundreds and hundreds of thousands of wildebeest, zebra and gazelles trek across the vast Serengeti plains. 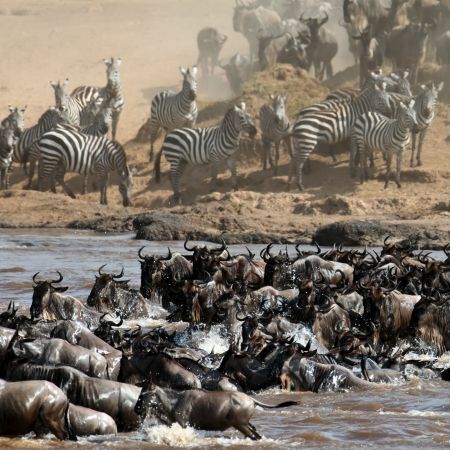 Tanzania is synonymous with the Great Migration, and with careful planning and a little luck, it is possible for visitors to be at the right place to witness this amazing annual wildlife event. Each year, literally thousands upon thousands of wildebeest, zebra and gazelles trek across the vast Serengeti plains towards Kenya’s Masai Mara, in search of new grazing grass. It is estimated that just over 2 million animals in total make this migration from one country to another and back again - a round journey of just under 2,000 miles. The story begins in the Ndutu region of the Ngorongoro Conservation Area and the Southern Serengeti plains from December, when the wildebeest congregate together to feed on the nutritious grassy plains. About half a million calves are born over just a short 2-3 week period during February. After a couple of months, once the calves are strong enough to begin the journey with their mothers, the herd sets off on their arduous journey northwards. 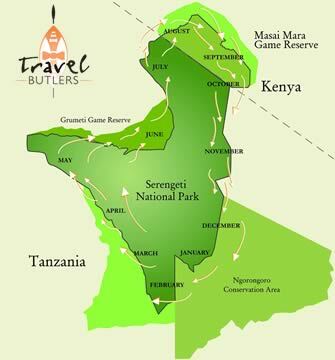 From April-May time, the Seronera Plains, in the heart of the Serengeti, come alive with the migrating herds. As this area is also home to resident leopards, cheetah and lion, it is an exciting place to be staying! Some of the herd continue to head directly northwards from here, but the majority will veer off towards the west, and by June, the first of the herd reaches the Grumeti River in the Western Corridor. Many lodges are based around this area, some even giving visitors the perfect opportunity to witness this somewhat blood-thirsty river crossing from the comfort of their lodge deck or private verandah. Those animals who do make it across by avoiding the snapping jaws of hungry crocodiles continue to push northwards, crossing into the neighbouring Grumeti Reserve and head up through the Ikorongo Game Reserve. By July-August time, the migrating wildebeest and zebra are spread across the far Northern Serengeti plains, now into the final stages of their Tanzania journey. Although they can by now almost smell the fresh green grass across the border in Kenya's Masai Mara, they are not there yet. The Mara River flows down from the adjacent Masai Mara National Reserve and through the northern Serengeti plains, so this is yet another obstacle that stands in the way. Whether you witness a Mara River crossing in the Serengeti or the Masai Mara, it is considered to be the biggest and the most dramatic of all wildlife crossings, and has been the centre of many documentaries. Having said this, for visitors who do travel to witness the crossing in the Serengeti, you will be pleasantly surprised at the number of vehicles sharing the event with you - because of the remoteness of the area, it attracts significantly fewer visitors - although it is not uncommon in August in particular to witness a river crossing every day. Then it is time to say goodbye to the herds, as they cross into the Masai Mara for the next few months and are rewarded with the fresh grass they have been anticipating since the start of their long trek. From November onwards, the herds have reappeared back into the Serengeti eco-system, and begin their trek back down south, for the whole cycle to begin again. If you want to come to Tanzania to experience this extraordinary event, then you must be prepared to both book early (as this is not surprisingly THE most popular time for visitors), and also pay high season rates.